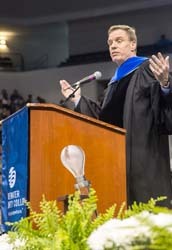 The senior United States senator from Virginia, a longtime supporter of community colleges, was the keynote speaker for TCC’s 60th Commencement Exercises, held Saturday morning at Old Dominion University’s Ted Constant Convocation Center. “The truth is, as you sit here and celebrate the class of 2015, it’s great what you’ve done, but you didn’t get here alone,” he said. “After this ceremony, call your mother, call your father, call your girlfriend, call your husband, brother, your sister. Warner also lauded the college for being the second largest provider of higher education in Virginia. The first in his family to graduate from college, Warner was valedictorian of his class at George Washington University and went on to earn his Juris Doctorate at Harvard Law School. He echoed the words of student speaker Frank Dixon, whose speech preceded his. Warner started two unsuccessful businesses and lived out of his car prior to co-founding Nextel and a series of other companies. Acknowledging the trying economic and political times that leave many disenchanted with the government, Warner challenged the graduates to be agents of change and be part of the national dialogue. Dixon, who earned a Certificate in Computer-Aided Drafting and Design Technology, received his Associate of Science in Engineering last May. He attended TCC and ODU concurrently this spring and spoke about the lessons he learned along the way. Warner recognized Johnessa Richard, the youngest of TCC’s graduates at age 17, for completing her Associate of Science in General Studies four weeks before she will graduate from I.C. Norcom High School. Richard is TCC’s first recipient of the Governor’s Medallion, meaning she earned an associate degree while in high school. Richard will attend Old Dominion University to major in biology this fall. 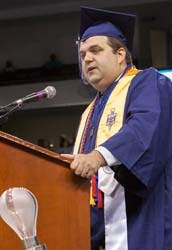 Among TCC’s 1,729 graduates, 837 graduated with honors, and 183 received more than one credential. Fully 60 percent are women. Lee Mindadkis, 74, is the oldest of the class, having earned an Associate of Applied Science in Information Systems Technology and a Certificate in Network Security. In addition to attaining her Associate of Applied Science in Occupational Therapy Assistant, Mary Spruill also received a diamond ring. Stepping down from his seat as Spruill exited the stage, Alex Blose knelt and proposed to Spruill. She gave him a tearful “yes” to the delight of the crowd, including some 35 friends and family seated nearby. The Smithfield couple plans an October 2016 wedding. After crossing the stage and shaking hands with the president, graduates received their TCC Alumni Association pin, making them part of a network of 120,000 alums.